Highland’s Makenna Belcher goes up for a hit in her team’s thrilling five-set win over Northmor in a battle of undefeated volleyball teams. Hope Miracle attempts a kill in Northmor’s Tuesday volleyball match with Highland. At Northmor on Tuesday, the Highland volleyball team dropped their first sets in league play since 2012, but were still able to win a five-set thriller by scores of 25-23, 25-13, 21-25, 19-25 and 15-6. 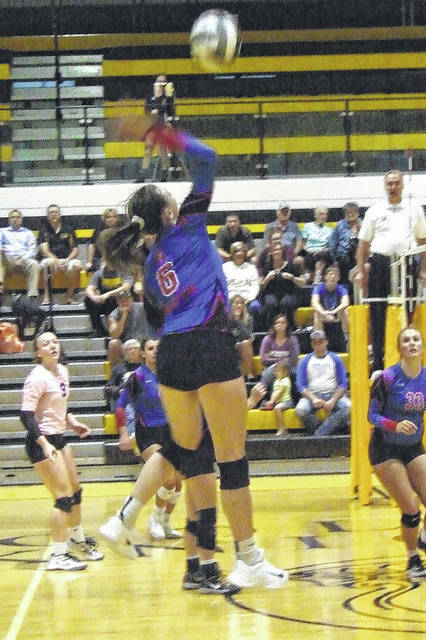 In a battle of undefeated teams, it looked like the Scots would pull off a three-set win after they battled back from a deficit to take the first and then cruised through the second; however, Northmor battled back to push their guests to the brink. “This is the first team I’ve had that’s come back from that — we’ve never pushed them past three,” said Knight coach Kara Wright. Scot coach Rob Terrill noted that his team rebounded after dropping consecutive sets to play a strong fifth and preserve their perfect record. The first set may have proved decisive to the match’s final outcome, as it took a late Scot comeback to keep them from falling into an early deficit. Trailing 7-5, Northmor got six straight points from Jordyn Zoll to take a lead they would hold until the set’s waning moments. The Knights led by as many as seven points in the set and were up 22-15 after three straight points by Kelsie Fike. However, the Scots were able to get a defensive stop and then tallied seven points on the serving of Bailey Santo to move in front by one. A defensive point by the Knights tied the score, but they gave the ball right back to Highland, who took the set on a point by Krista Walters. Highland then controlled the tempo in the second set, breaking a 4-4 tie with three points by Makenna Belcher and, later, getting six from Bridget Oder to expand their advantage to a 15-6 margin on their way to taking a 25-13 decision. A defensive point and two more from Oder allowed the Scots to open the third set quickly, but Northmor fired back with two points from Anna Donner. Hanna Bentley, Caitlin Thebeault and Fike all scored once and Zoll added two more points as the Knights widened their lead to a 14-9 count. While Highland would keep the game close, getting two points each from Belcher and Gena West, they would not be able to catch the Knights, who got a pair of points from both Bentley and Thebeault on their way to taking a 25-21 win. Wright noted that her team’s improvement from the second and third sets could be credited to its seniors. The fourth game went much the same way as the third. Highland took an early 3-1 lead behind two points from Oder, but Northmor fought back, getting one points from Bentley, three from Thebeault and two more from Fike to lead 12-7. The Scots got a defensive stop and three from Santo to close within a one-point margin, but Northmor responding, getting one point from Zoll and two more from Donner to lead 17-12. From there, Northmor was able to maintain a lead the rest of the way, as they tied the match at two sets each. Terrill said that his team simply wasn’t playing to its ability in the fourth game. Highland then opened the fifth set with a point by Santo and six from Oder to jump in front by an 8-1 margin. The Scot defense then controlled the action, only giving up one point to Northmor’s servers as they claimed a 15-6 win to edge their hosts in the match. Despite her team suffering its first loss of the year, Wright noted that they likely gained a lot of respect. For his part, Terrill simply felt fortunate to be the coach of the talented Scots, noting that his team has a good mix of seniors and underclassmen. In the match, Highland got a school record 41 kills from Terry, while Walters added four blocks and four kills, Belcher had five kills and Parker Steck added six kills. For the Knights, Donner had 17 kills, four solo blocks and two block assists; Cristianna Boggs had 30 digs, Leslie Brubaker finished with five solo blocks, two block assists and five kills and the duo of Zoll and Thebeault contributed 27 assists.